To squeeze Ubuntu to my Macbook Pro I actually prefer reinstalling from scratch since Apple installs quite some unused stuff. But, if you don't mind losing some gigabytes, just proceed here, this is the "less destructive" way to go since your original operating system (and thus your home directory with all your documents) remains intact if the partitioning proceeds without error. Please take my word as warning: Although I'm using dual and triple boot computers for years and the described procedure works for me (in fact I'm doing it whilst writing this article), I can't take any responsibility that it will work for you as well, and I can't take responsibility for any damage or loss you may encounter. If you still choose to follow me, please, backup your home folder NOW. I'll tell you a short story: about three years ago, I decided that EXT3 is the way to go on my 1.8TB RAID containing about 800GB of data. It was NTFS, and since there was no utility to convert NTFS partitions to EXT3 and I didn't have a 1TB drive at my disposal (at the time 300GB was the top HDD size, at least in what I could have bought for my hardly-earned money), so I decided to take the risk and proceeded without backup. Using GParted I planned to decrease the size of the NTFS partition to 900GB, and would have created a 900GB EXT3 behind it, would have copied everything to the EXT3, then would have deleted the NTFS & would have resized the EXT3 to use the whole drive, having 1.8TB again. If I'm not mistaken everything went well up till the last step: the NTFS was copied, was deleted, and the EXT3 resize failed. Early version of GParted? Data inconsistency? No clue. But the process was stuck, and after a day (you can imagine that day!) I had to stop it and start looking for ways to retrieve my data. Fortunately I was able to get back almost everything from the deleted NTFS partition and by now I have external drives backing up my RAID with rsync regularly (and I'm thinking about migrating my backups to EC2 or another cheap cloud-provider); I have learnt from my own mistake, so you should learn too: MAKE BACKUPS when dealing with such sensitive issues like filesystem-resizing operations. Let's go! 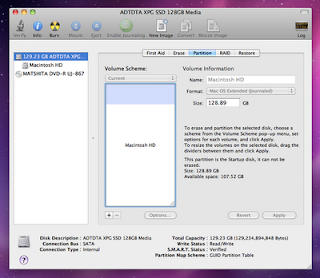 Start Applications->Utilities->Disk Utility and click on your Hard Drive on the left panel. Now on the right side, click Partition. Shared Will be visible from both Ubuntu and OSX, containing the documents we are working with: videos, pictures, source-files, etc. Thus, it should fill up the remaining space from all the other partitions. Since the HFS driver in Linux is not able to read/write journaled HFS partitions, we will have to change the type of this partition to non-journaled HFS. It should be non-case-sensitive, since Adobe products are fooled with case-sensitive file-systems. So, it will be "Mac OS Extended", which is "non-case-sensitive/non-journaled". you only have to work out a regular backup-procedure to the SHARED partition, since everything on the OSX and UBUNTU partition can be regenerated by a reinstallation. So far, so good - we will just have to fix the sizes and the names now. Apple's Disk Utility is a tricky one, since if we change the size of a partition on top, it also changes the size of the partitions below. So we'll go from the bottom. Now you can freely click on any of the rectangles (e.g. partitions) to verify their size. If you are satisfied with the results, click Apply. Smart Snow Leopard confirms the non-destructive manner of our operations. Since you have already made plenty of backups of your data, you can click on the Partition button right? After making sure your backups are intact, click Partition to proceed. Now you can proceed to Install Ubuntu 9.10 "Karmic Koala" on an already partitioned drive. There is a problem for me. I am trying to follow this to dual boot Ubuntu 10.04(PPC version) on my Powerbook G4. I can change the volume schemes to have 4 partitions, but they are greyed out and it says, "This disk contains the startup volume and can't be partitioned." Eliot, although I don't have any experience with pre-Intel macs, but I suspect the online resizing of the partitions like in the article is only possible with the Intel macs. You'll have to boot from the install disc and do the partition from there as suggested by this forum thread.